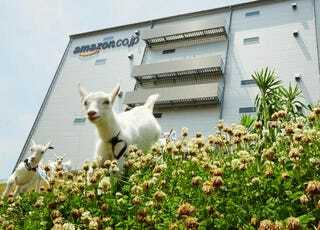 Last summer, Amazon Japan hired a stable of goats to manicure its lawn. This year, it is hiring even more. According to Hatena News, Amazon has hired double its goat capacity—now, there are between thirty and forty of them. The goats wear employee i.d. cards while working, which consists of grazing all day. The goats are on the clock from 9am to 3pm every Tuesday and then head back to their goat farm to do goaty things. That sure bleats, I mean, beats having to work overtime. As Kotaku previously mentioned, this isn't the first tech company to have eco-friendly lawn care: Google also brought in goats to tend to its lawn.